Washed up in a hostile city, battleweary and out of luck, the Oathsworn lie waiting for their reluctant leader, the young Orm, to bring them back once more to wealth and warfare. But Orm’ s prized sword, the legendary Rune Serpent, is gone, stolen by the rapacious Starkad, and with it the runes writ upon the hilt that only Orm can decipher. The Oathsworn embark on a dangerous mission to reclaim their precious sword as they pursue the elusive Starkad across the turbulent wolf sea. Unafraid to fight and cunning in the ways of men, they wreak violence and bloody revenge on their enemies. 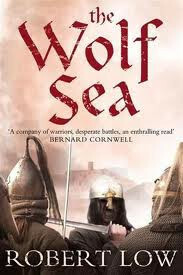 Caught up in the treacherous battles in the East between the rulers of Constantinople, aided by hordes of Viking mercenaries and the Arabs, their adventures will take them from Greece to Jerusalem, across the treacherous wolf sea where only the hunting hungry dare set sail.